A police officer in Prince George's County, Maryland, drove drunk and crashed his patrol car early Thursday, his own police department said. Sources tell News4 the officer disappeared for more than a half-hour after the crash and then returned. Police Officer 1st Class Christopher Brown was charged with multiple counts of driving under the influence and speeding, the Prince George's County Police Department announced Thursday afternoon. News4 was first to report the news, on Twitter. Police say Brown crashed near the Capitol Beltway and Pennsylvania Avenue about 2:30 a.m. Thursday. 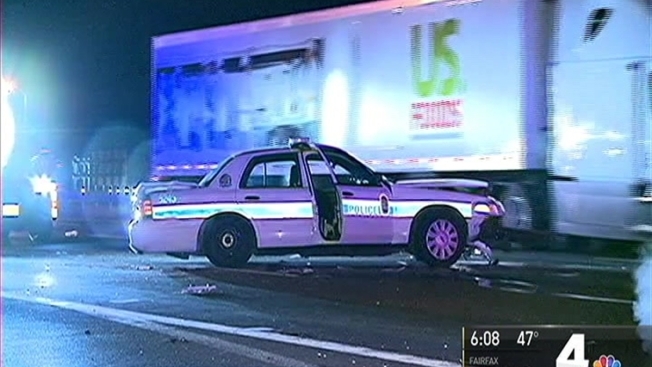 He clipped the back of a tractor-trailer, lost control of his cruiser and hit a guardrail, police said. He was off-duty at the time of the crash. District Heights police were first on the scene. They saw the police cruiser, which had damage to the front end, but the officer was gone. Sources with knowledge of the investigation told News4 someone picked up Brown after the crash. He was gone for 34 minutes and then returned, sources said. Brown returned a short time later. Officers suspected he was under the influence of alcohol and arrested him. No information was available immediately on who picked up the officer. Brown, who joined the police department in 2009, previously crashed his police cruiser while under the influence in 2012, police said. He was arrested after that crash and pleaded guilty to those charges. He was allowed to keep his job because that crime was a misdemeanor and Brown followed all the terms of his sentence, a police department representative said. Police Chief Hank Stawinski said he was disturbed by what happened. “I find the circumstances surrounding this incident gravely troubling, and I apologize to the community for the appearance of impropriety," he said in a statement. The police chief promised transparency. "Know that, as always, when I have the facts, I will take appropriate action to remedy this, and I will make the facts known to the public,” Stawinski said in a statement.